Featuring a geothermally heated swimming pool, East West Studio Apartments offers self-contained apartments or B&B options just 1 km from Lake Rotorua. 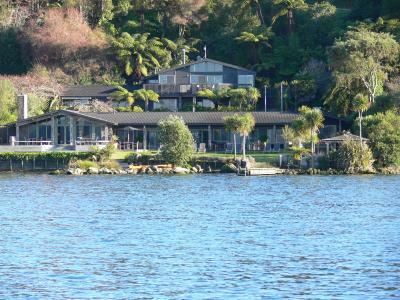 This boutique Bed and Breakfast is situated on the shores of Lake Rotorua in a private and peaceful location. Koura Lodge guests enjoy free buffet breakfast, an outdoor hot tub and a sauna. Offering free Wi-Fi and included continental breakfast, Lakes Lodge B&B Rotorua is 2 minutes’ walk from central Rotorua. Guests enjoy a breakfast room and a communal lounge. All rooms offer a flat-screen TV with cable channels. Offering free Wi-Fi and included breakfast, B&[email protected] Redwoods is ideally located to experience many of Rotorua’s best hiking and cycling tracks. Your suite features a patio or balcony, a flat-screen TV and fluffy bathrobes. Offering free continental breakfast, free Wi-Fi and an outdoor pool, Mokoia Downs Estate B&B is situated on 5-acres of beautiful farmland. It is just a 15-minute drive from Rotorua Town Centre. Set in Rotorua, 5 km from Rotorua Museum, Tickled Trout B&B boasts a barbecue and ski storage space. Free WiFi is available throughout the property and free private parking is available on site. Offering a sun terrace and views of the garden, Maple House B&B is located in Rotorua in the Bay of Plenty Region, 3.5 km from Rotorua Museum. Free private parking is available on site. For your comfort, you will find bathrobes and a hairdryer. Featuring free WiFi, B&B Abundance offers accommodation in Rotorua, 700 metres from Polynesian Spa. Free private parking is available on site. Certain units feature a seating area where you can relax. Rooms are fitted with en suite bathrooms.